What a morning! I don’t even know if you can call 3:20 morning. We dropped off the kids at the Funks last night and stayed up until midnight getting ourselves ready for the trip. The two younger ones did great. They were excited to have a sleepover with friends. Carson didn’t particularly care one way or the other but Emilia was very emotional about us leaving. She will start crying, and then I start crying. Peru has been experiencing catastrophic flooding and mudslides to incessant torrential rains over the past few months. Roads are washed off, people have been displaced, and 72 people are dead. Mud and contaminated water entered the sewage system in Lima forcing the city to shut off the water for 9 million people. In order to be as flexible as we need to be during our trip we packed one carry-on bag per person and a personal bag. 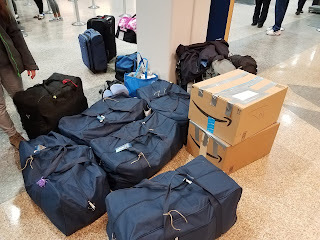 That left Todd, Claudia, Jordan and I with 100 lbs each of checked luggage available to us. We decided to use that free space to take relief supplies to Peru. It’s incredible that this immense tragedy has gone pretty much unnoticed in the US. Claudia and I got on social media to inform others about what was happening and asked family and friends to help us with our goal. People came through for us and donations started pouring in. We had more than what we could take and have made arrangements to have the remaining items ship to Peru next week. So, this morning, in addition to our bags we were hauling 400 lbs of relief supplies. It made unloading the car, transporting and checking in additionally difficult. The lines at the SLC airport were extremely long. The TSA check in wove around the designated area and extended all the way to the baggage claim area. We ended up leaving and going to the adjacent terminal, where there were only ten people ahead of us. Why don’t they direct people to the other terminal whenever they are overcrowded? That’s bureaucratic inefficiency at it’s best. Even our flight was somewhat eventful. A passenger a couple of rows back started experiencing chest pains and difficulty breathing. Fortunately, there was a physician on board who monitored her health during the last part of our flight. She was given oxygen and upon landing a paramedic escorted her out of the plane before any of the other passengers could deplane. Once we arrived in LAX we had to exit our terminal, walk to another building approx. a block away and go through the whole check- in and TSA security line again at a different terminal. This is not the fun and glamorous part of our trip! and let us go. By that time they were doing the last call on our trip. We ran to the gate and scrambled to display boarding passes, passports, and immigration papers. In all the confusion I couldn’t find my passport anywhere. In the end, the flight left without us. My passport was with my things all along, but because of the extra security checks my things were a mess and it took some digging to find it. I was madder than mad at myself, at Mexico officials, at AeroMexico. I just couldn’t believe how hard they made it for all of us. When we went to the information desk I saw several other people complaining about missing the same connection because of excessive security checks. The airline tried to tell us that it wasn’t their fault. That it was the Mexican government security process. We argued that they book flight connections and they should allow enough time so people can make their flights. 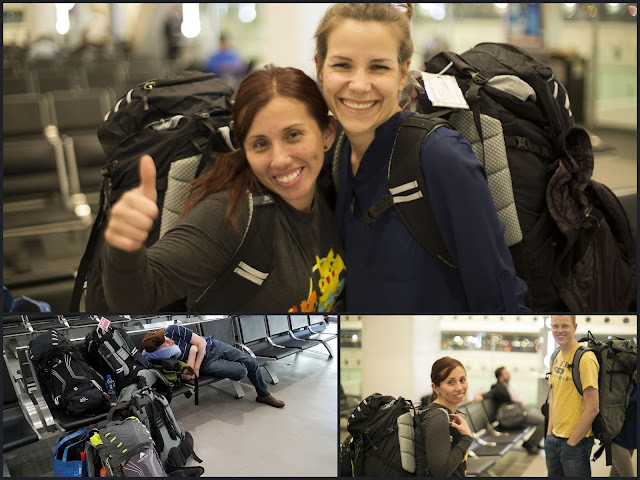 In the end, we had to spend an extra six hours at the airport and catch a red eye to Lima. The consequence, however, is that we missed our connecting flight out of Lima and had to adjust our itinerary accordingly.